Boston police photographed evidence at the scene of a fatal shooting on 300 block of Bowdoin Street. Late Halloween night, 16-year-old Gerrod Brown was shot and killed in a housing development in Jamaica Plain. The Brighton High School football player was among 16 males between the ages of 16 and 19 killed on Boston streets in 2017 — double the number of teenagers killed the year before, according to crime data provided to the Globe. During a year in which violent crime overall fell by 7 percent and the number of homicides increased slightly, the death toll among some of the city’s youngest residents was alarming, said Boston Police Commissioner William B. Evans. Leroy Peeples Jr., executive director of the PIM Project, an antiviolence organization, said he sees violence permeating the lives of boys as young as 5 years old enrolled in his Mighty Mite Mentors program. As of Friday, there were 58 homicides in Boston in 2017, according to the Suffolk district attorney’s office. Last year, there were a total of 55 homicides in Boston, including five killings investigated by State Police, according to the district attorney’s office. Gunfire killed nearly all the victims in 2017, with fewer than a dozen people dying from stabbing or trauma, figures show. Three out of four victims were listed as black or non-Hispanic black, and nearly all of them were men. 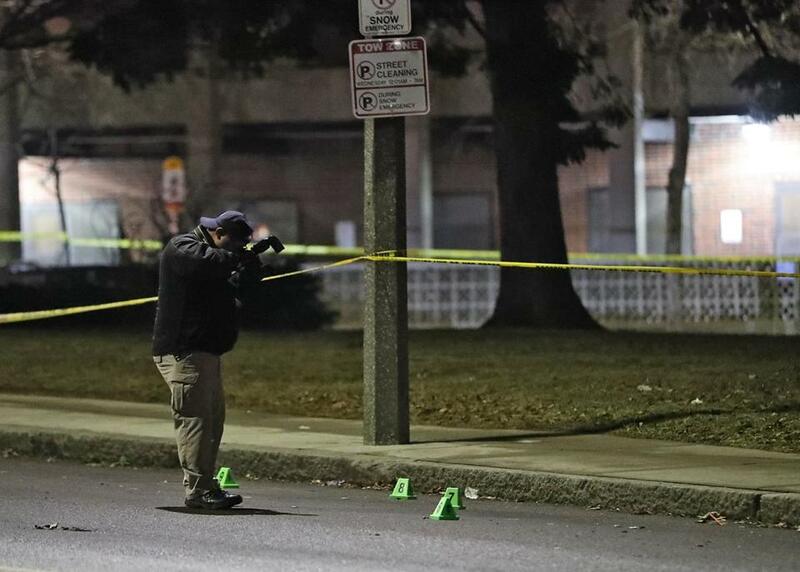 Most of the killings occurred in Roxbury, Dorchester, and Mattapan, figures show. Suffolk District Attorney Daniel F. Conley said well over half of the cases had a connection to gang activity. The number of people wounded or killed by gunfire rose to at least 258, compared to 229 last year, Boston police figures show. Nationally, the number of murders is estimated to drop by more than 4 percent this year, according to an analysis of crime in the country’s 30 largest cities by the Brennan Center for Justice at New York University School of Law. The examination, released last week, found Boston had far fewer homicides than most cities its size, including Washington, D.C., Baltimore, and Nashville. But in terms of the city’s murder rate, the Brennan Center found, Boston has more killings per capita than New York City and Los Angeles. In 2017, Boston is on track to have a murder rate of 8.7 per 100,000 people, compared to the estimated rates of 3.3 per 100,000 in New York City and 6.8 per 100,000 in Los Angeles, the Brennan Center said. The 58 homicides tallied in figures released by the Suffolk DA’s office include a homicide case handled by State Police detectives, who have the authority to investigate deaths in parts of the city that are owned by the state, such as certain parks and highways. Boston police reported the same number of homicides, but the victims included in their count vary slightly. Their figure doesn’t include the case investigated by State Police or the death of a woman in a road incident, but does take into account two deaths that were declared homicides in 2017 even though the victims died in 2015 and 2016, respectively. Regardless of how the deaths are counted, Commissioner Evans said getting guns off the street is his top priority. Officers confiscated nearly 1,000 firearms this year, including replica guns and guns turned over during a buyback program held earlier this month, he said. As of Dec. 24, officers made 441 arrests related to illegal firearms, compared to 479 during all of 2016, police said. One explanation for the surge in shooting victims is the increased availability of powerful firearms with the capacity to discharge many rounds of ammunition in a short period of time, Evans said. Such weapons, he said, have the potential to fell more people. Beginning in January, authorities will have a new venue for combating gun violence, Conley said. A judicial session devoted exclusively to processing gun offenses is launching in Suffolk Superior Court after being operated for more than a decade in the Boston Municipal Court. In Superior Court, Conley said, defendants face stiffer penalties for crimes involving the illegal possession and discharge of firearms. For example, Superior Court judges have the authority to impose five-year prison sentences on defendants convicted of carrying a firearm illegally. In District Court, the harshest punishment is two and a half years behind bars. 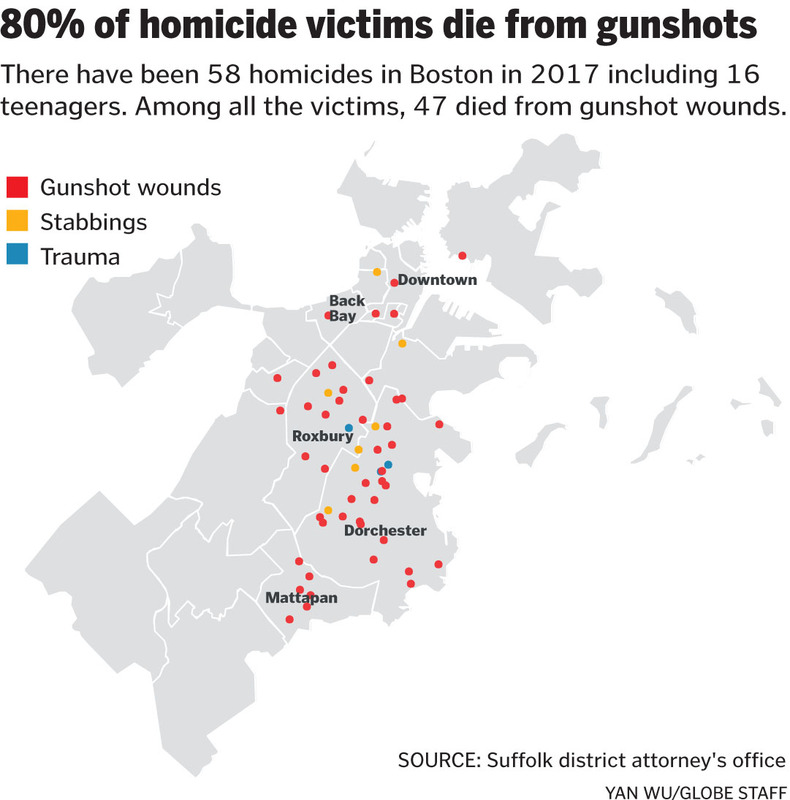 Tina Chery, president and chief executive of the Louis D. Brown Peace Institute, said Boston needs to take better care of the families of homicide victims if it wants to end the deadly violence that has beset the same neighborhoods for decades. Many families who lose a loved one to homicide, she said, aren’t treated with compassion and dignity. They may be traumatized for years after the killing and some suffer the indignity of hearing the person they lost referred to as an “impact player” or someone who was “known to police” after the murder, Chery said. “The community can’t step up when there’s no compassionate response,” she said. Rufus Faulk, a longtime Roxbury advocate who worked for the Boston TenPoint Coalition for 12 years, echoed Chery’s concerns. Todd Wallack of the Globe staff contributed to this report. Laura Crimaldi can be reached at laura.crimaldi@globe.com. Follow her on Twitter @lauracrimaldi.